During the hours of 6-10pm on the evening of Wednesday, 14th February 2018 a Green and Yellow Quad Bike was stolen from one of the village residents drive.The owner advises that the bike had a flat battery so it is likely this had to have been pushed out towards a vehicle. If anyone saw anything suspicious could they please communicate with the Parish Clerk on 01842 815213 or email silv1948@sky.com. Open Reach will be holding a 10k charity walk from Santon Downham Village Hall on Sunday, 26th November 2017. The event organisers have sent out letters to their runners advising them to take care when parking their cars. Marshals will be on hand and the area will be signposted and coned off. The Village Hall will be selling teas/coffees and bacon butties (sorry no cakes) on this day mainly for the walkers but of course the village residents will be more than welcome to pop in and of course, to cheer on the walkers. We are happy to advise that there are now some books on the shelves in the Phone Box and anyone may help themselves to a book to read, or add another to the shelf. 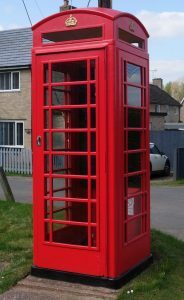 We have, following a most successful training course, added the defibrillator equipment to the Phone Box but we are currently showing this as “not in use” until all Emergency Service requirements have been followed. Please note that the 7th September is incorrect for the next Parish Council Meeting, which in fact is the 4th. An update, the potholes and sweeping will take place WEATHER PERMITTING on Monday, 24th July with the main re-surfacing work on Marks Lane, from the top of the main road, past the Village Hall, down to the junction and left only (Phase I) taking place on Tuesday, 25th July. You may have noticed that the telephone box has been de-commissioned. Our plans are to renovate and then to make use of the space as a community book exchange. We are also exploring with Rotary and Community Heartbeat Trust the possibility of a defibrillator being installed for emergency use. More details will follow in due course.